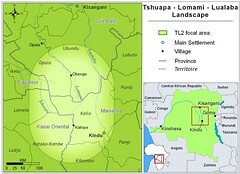 The first exploration of the TL2 landscape (Tshuapa – Lomami – Lualaba) was June-July-August. 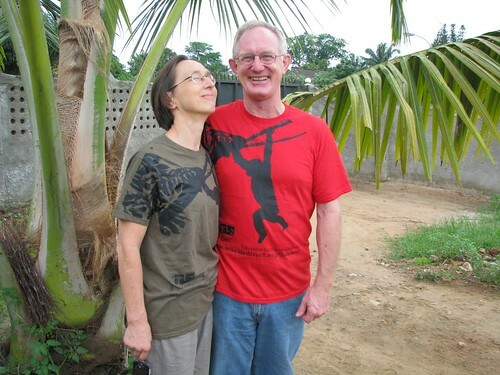 Now the teams are re-gathering in Kisangani and about to launch the second exploratory mission. What have they already learned? What big unknowns remain? Dino and Maurice sharing tips with diagrams in the sand before splitting into two teams to explore the remaining unknown areas. Behind them their tents are pitched at the temporary Kisangani base. each about 150km through pathless forest. The routes are traced ahead of time to GPS points. One recce, moving from point to point, generally takes a team anywhere from twelve to fifteen days. During the three months down the Lomami two teams did six large recces (map below) and a third smaller team carried out shorter recces close to the river. The first map on the top-left shows the outline of the TL2 landscape that we plan to explore (see map below for rivers and relief) and the colored squares show where the teams, so far, have actually reached and the amount of time spent in each GPS-defined square. 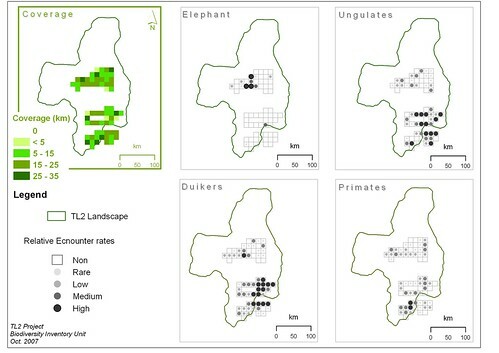 The other maps show the distribution of elephants (!) and other large mammals. So, what did Ashley and teams find out? 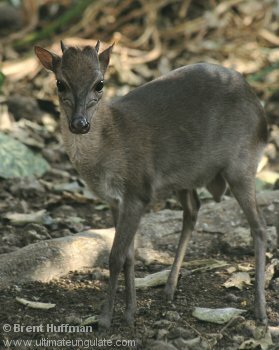 There are still good populations of duikers, small forest antelope, including the blue duiker, the bay duiker, the yellow-back duiker and several species of yet to be identified red duiker. These are all most abundant in the South. The blue duiker is the smallest and most resilient to hunting of all the forest duikers. The only forest antelope that is smaller is the Pygmy Antelope that hunts in natural openings and around the edges of agricultural clearings. There are still good populations of the larger ungulates (including okapi as well as forest buffalo and pig) and of primates. These too are all most important in the Southern forests. 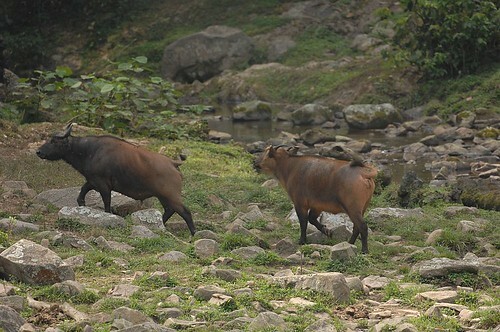 The forest buffalo is different from the savanna buffalo. ©Reto Kuster. It moves in smaller groups, is often more reddish, and has smaller horns. The Mbuti (Pygmies) consider it the most dangerous forest animal to happen on accidentally in the forest! What is alarming is the disappearance of elephants (see map above). They are essentially gone from the South after being hunting out by rebels skirting the forest in the mid-1990s. Forest elephants are now reduced to a single group of populations around Obenge. And here they are under intense hunting pressure by groups using military arms. 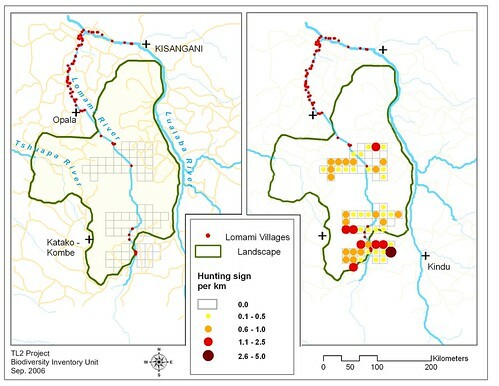 The map on the left shows where permanent villages of more than 100 inhabitants occur along the Lomami. Only the very north has frequent villages and the middle sector is close to empty. The map on the right shows where the teams found hunting sign along their transects…and it was everywhere. What is remarkable is how widespread the hunting pressure can be despite the scarcity of permanent villages with 100 or more inhabitants. And the Bonobo? Congo’s own species of ape – chimpanzee like – but long limbed and matriarchal. It too follows the pattern of most of the other large mammals and is most abundant in the south. 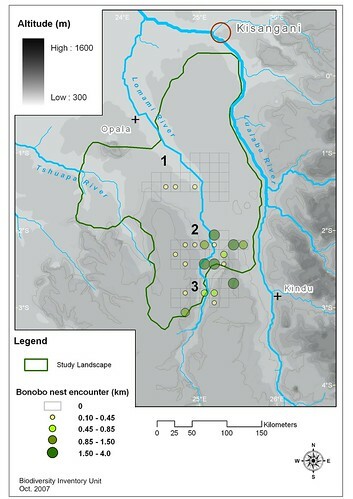 Bonobo’s were more abundant in the south of the TL2 landscape — Why?? How much are these distributions due to hunting to feed the market of Kisangani or how much are they a matter of preference of the slighter higher and more broken “edge” forests of the south. How much are they a result of avoidance of swamp forest? 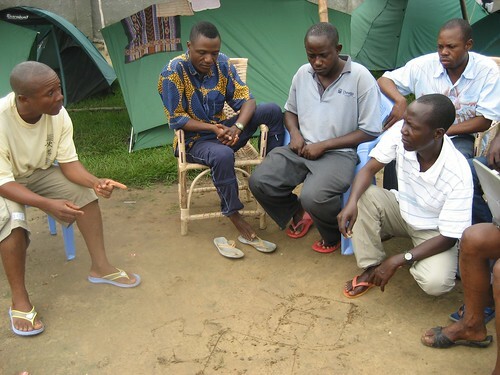 All of these questions will go into the forest with the teams that are just now launching from Kisangani. There are four teams that will divide up to cover the unexplored portions of the TL2 landscape. 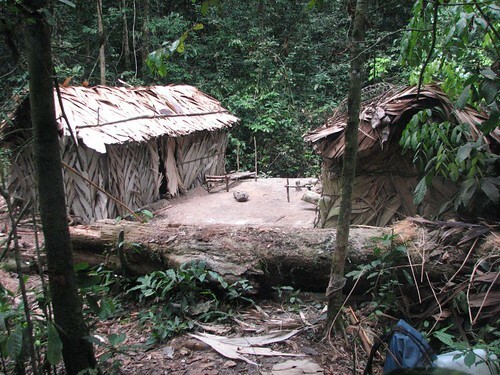 Ashley will move down the Lomami to the center of the landscape with the teams led by Bernard and Maurice. He will also be with Lambert and Crispin who are setting up a community conservation project in Obenge (more about that later). John will cover the northeast portion with Dino (above) and Faustin. This entry was written by Terese Hart, posted on 2007-11-09 at 4:49 pm, filed under About the project, Bushmeat, Guides and how to. Bookmark the permalink. Follow any comments here with the RSS feed for this post. Post a comment or leave a trackback: Trackback URL. Yeah, the shirts are awesome! So, while y’all were getting ready for this expedition, we all fell in love with the bonobos at Lola Ya Bonobo. So now we’re doubly interested! Oh, thanks F.J. for reminding me of the other questions I have: Are the hunters you refer to actually poachers? Ashley I know you had to post it but I think if I see another pic of the one some time ago of the freshly killed bonobo (remember it was so horrible) – I shall cry myself to sleep for endless nights! I never get it out of my mind totally! I am afraid of what you may find! Protection for wildlife — not yet BUT that is our ultimate goal. And the diplomacy behind the scenes is pointing towards positive results. Real protection though will mean a lot more than declaring a Reserve. 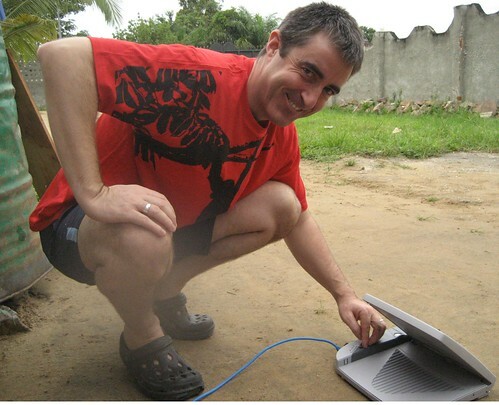 It means strong community support and (in Congo today) strong international support. Is hunting poaching. Not necessarily UNLESS it is one of Congo’s protected species that is being hunting. The bonobo and the elephant are both completely off limits. But again that is the reason to create a protected area : to have an area that will remain a reservoir of all wildlife. Good comments all of them and a delight to read them. I’ am so scared about the future of the forest elephants. According to your maps they disappeared almost everywere in TL2. Only a small population in the center survived. Probably the complete ecosystem including a lot of tree types will suffer from this and possibly bonobos too. I remember this description from ashley about this old overgrown “elephant bath”, with lots of animals especially bonobos but no elephants at all. Exists anywhere a map of this new reserve. Big thanks to you conservationists, who are working hard for our future and the future of our kids. Thank you very much for this Michael. A couple of people have mentioned this new Reserve to me. Our hope is that this will be followed by real conservation. Many of Congo’s parks are unfortunately paper parks as the government itself has little to invest in Conservation. A relatively easy step is getting an area claimed a Reserve, more difficult is moving towards any real change in the conservation status…that requires massive community conservation efforts and considerable international support, often a long slow process.